We need to recognise the diversity of pollinators needed for the web of life to be sustained. A dominant percentage of plants that provide food and habitat in a healthy environment depend on a very wide variety of pollinators, including bats, birds and insects. Only a few plants are wind and water pollinated. It is essential that we provide habitat and other environmental requirements to ensure that sufficient numbers of these pollinators are present in a healthy system. The system of food production developed by humans has necessitated the provision of large numbers of pollinators in concentrated areas of broad acreage. Some of this pollination is carried out by bees naturally foraging in surrounding trees and crops. Many farmers pay beekeepers to place beehives amongst their crop to ensure pollination. Where large acreage has been cleared for crop growing, paid pollination is essential as there are no large populations of other insects in the area to carry out any ‘incidental’ pollination. Pollination is essential for the production of many of our vegetables, fruits and nuts and even the legume pastures necessary for the livestock industry. Two thirds of food crops grown in Australia require insect pollination to set economical quantities of seeds or fruit. The remaining crops such as wheat, maize and pawpaws, are wind or self pollinated. Honeybees (Apis mellifera) are an efficient agent in the pollination of most of our food plants, both for edible fruits and seeds for propagation. Having evolved in cool to cold climates, they have adapted to all areas of Australia where they forage for pollen and nectar year round. Managed hives are portable and can be moved where needed to pollinate large areas of horticulture and crops. Enhancing this are the large numbers in each hive and their ability to forage over 5 km from their hives. Their constancy in visiting only one type of flower on a flight is over 90%. Native stingless social bees are effective pollinators of many horticultural crops as well as native plants. They are active pollen gatherers so a large percentage of foragers are targeting pollen rather than nectar. Placed in a crop, they will lock on to the particular pollen source and work that flower exclusively. Their foraging range of a few hundred metres further locks the foragers into the target crop rather than seeking food further afield. These attributes are considered when placing hives. The bees will pollinate effectively when placed within the crop and when there are no competing pollen sources available. Native solitary bees are the original, natural pollinators of Australian native plants. They are now being recognised and generally being used successfully in combination with other pollinators. Many of the solitary bees are extremely effective due to the unique and unusual ways they collect, carry and store their pollen. Some actually cover their whole body with the pollen. The natural flora has become a major resource for bees, and beekeepers (of honeybees and native bees) need this resource to build strong hives to use in pollinating large areas of crops. Bees, along with all pollinators, are under threat from newly arrived pests and diseases, habitat loss and chemical pollution. To combat these threats, beekeepers must be knowledgeable and efficient in management strategies to ensure that pollinators are there for our future food security. So, can honey bees and native stingless bees be kept in close proximity? It is quite common to find native bees and feral honey bees occupying the same tree. We remember one particular felled tree near Hivesville (yes, we lived in a town called Hivesville, situated out near Wondai), this tree was home to two honey bee colonies and three native bee nests. For many years we have maintained hives of stingless bees and honey bees in our gardens for successful pollination. They thrive together, along with the numerous solitaries. It is a point of discussion whether feral honey bees impact on native bees in the natural environment. Research conducted in several states showed that the abundance of nectar and pollen provided sufficient food for all. In a managed environment both species seem to flourish together. However this abundance is not always available to bees. Seasonal fluctuations and weather conditions can impact on food supplies. Experienced beekeepers are aware of these variations and manage their hives accordingly, harvesting only the honey that exceeds the needs of the bees. This is a subject for further investigation. 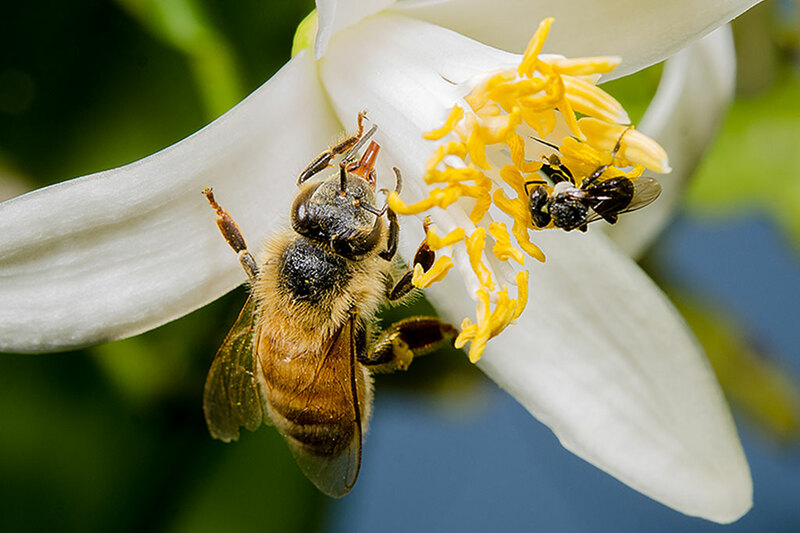 We recommend that if you are introducing a number of honey bees to your area, or increasing the number of native bee hives, plant out additional flowering plants that are most suited to the smaller stingless bees to help with the balance and cohabitation. A comprehensive listing of these particular plants, herbs, shrubs and trees is available by downloading our ATTRACT BEES document. Pic on right by Tobias Smith.